Acumatica Singapore: Linking Sales Order to Purchase. Stock Allocation. Linking Sales Order to Purchase. Stock Allocation. One of the questions from our partners was - why don't we have a topic at Acumatica University on how to tie Sales Order to Purchase Order, then break this link, then see the goods allocation in the inventory. Basic business process behind is when we sell something we may wish to buy goods for this specific sales order. And then, at some point we may reconsider and dedicate goods for another Sales. I am using Demo database to demonstrate it. What I did first is switched off sub items, not to mess up the picture. Step One. Create an Item in Stock Items screen. After Item created I made a receipt in Inventory for 1000 pieces. Step Two. Make a Sales Order. Here I used the above item indicating a line should be Ship Complete. Added some quantity and price. Take note of Mark for PO check box. Will use it in the next step. Step Three. Link SO to Existing PO. To achieve it, will mark check box Mark for PO. Then Press PO Link button. We may already have a PO, so we can link to existing one. We should select the line on that screen then Save to mark that existing PO to the SO. Step Three A. Create PO for SO on the fly. Alternatively we may wish to create new PO for that Sales Order. Let's go to Actions->Create a PO. Then screen below comes out. 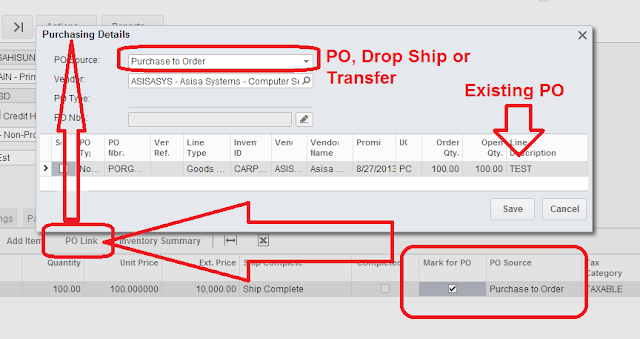 Here we need to indicate the Vendor and Location and then click Process to create a PO. Once created, SO will get link to that PO automatically. Here is the SO. Take note of the link. Step Four. Break the link. Allocate to Another PO. Let say we have reconsidered and wanted to reallocate the sales order to another vendor PO. This is achieved at the Sales order. Unchecked Mark for PO on the line, save. It will automatically remove PO link. Now lets link to another vendor PO. Check Mark for PO again. Save. Then call PO Link button. Now we can choose another vendor and PO. Step Six. Receive PO and see what Happened. And Sales Order can be now shipped. I created shipper document then confirmed it. Standard process. 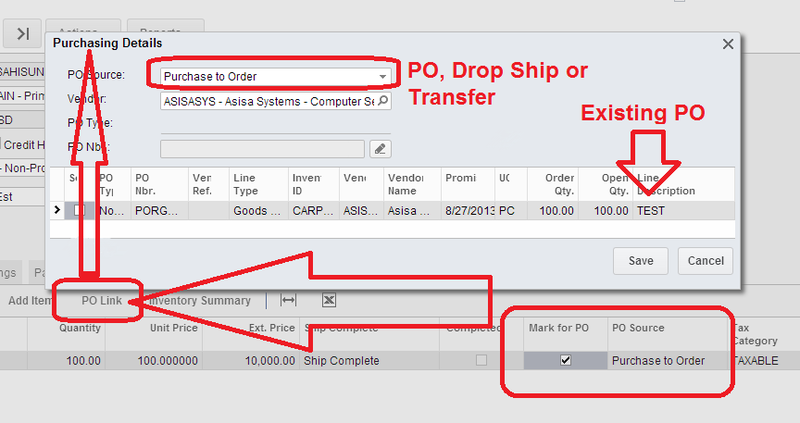 Once you receive the item into inventory, do you know if there is anything that prevents you from shipping the item on a different sales order than the one it was originally allocated to? In general, when you enter sales order, all the items on your stock are equal in qualities, and allocated to all sales orders. How would the guy in the warehouse know that hthis particular item is allocated for that particular customer? But if your items are serial numbered you can allocate specific items to a particular sales order. Doesn't look like it and sadly this is fairly common. 1) Negative stock allowance, because sometimes you need to ship before you've received. Although if I'm honest, I'm kinda glad it doesn't have this feature as it's a pain for figuring out costings! 2) Committed/allocated stock. Sales orders can reserve a stock qty, long before shipping. Stops any other order stealing that stock. 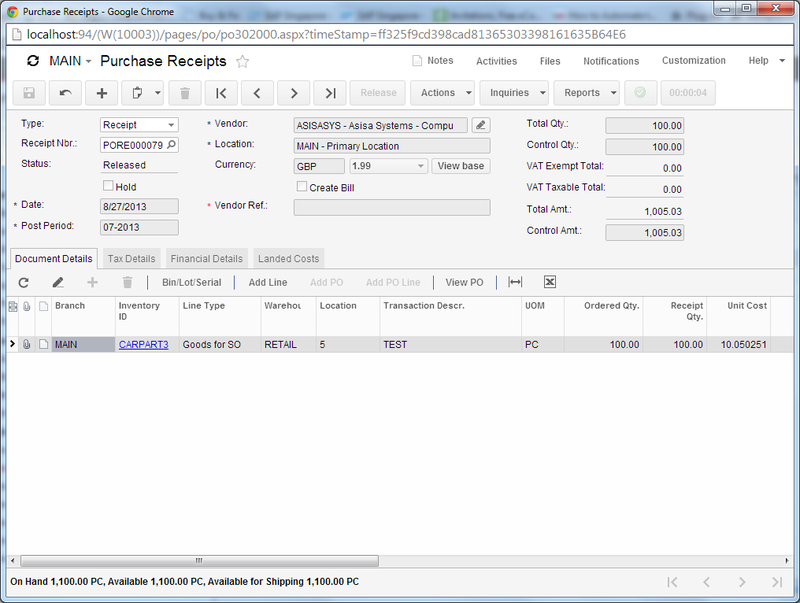 Also allows you to build up a large order as receipts come in so you can ship it in one shipment. 3) Automatic allocation following a PO receipt. So in the example above, once that PO receipt is released, it would action point 2 and allocate the stock to all the sales orders linked to it. I might log these in the partner portal. 1. Acumatica does have Negative stock option, and if you need it, you can switch it on. 2. Stock is physically allocated if you use serial numbers, if you don't use serials then you can not allocate any stock to specific order, even in theory. We have quantity Avaliable, and if you want to prevent sales when qty goes below available - we have all the means to do so. If you want to allocate "specific" stock - need to use serial or lot numbers. 3. No issue as long as lot/serial numbering is in use. In version 4.1 we have SO with Allocation. So even non serialized items are able to allocate now. - How to manage and separete the turnover of the every Vendor on the AP Invoice, Payment, Accounting ? - How to manage the many price of the SKU if i must buy it from some Vendor ? 1. You can use simple thing - separate AP account per vendor, or create a report that looks for specific vendor transaction only, groups by vendor, then shows you vendor performance figures. 2. Multiple price by vendor is managed in the Inventory module + Purchasing Module by creating Vendor based price in the Vendor Inventory screen. Nice discussion and explanation of SO and POs. Thanks. A lot of great features.